Suzuki Intruder SP has been launched ahead of festive season. It also gets a new dual-tone Matte Black-Candy Sandoma red color option. Prices of the Intruder SP start at Rs 1.05 Lakhs. As the festive season has just started, many auto brands are gearing up for launching new models or facelifts or special editions. Now, Suzuki has launched the Intruder SP (Special Edition) in India. It comes with a rear backrest and a new dual-tone colour combination of Matte Black-Candy Sandoma Red. Other than that, it receives no further updates. Currently, Gixxer comes in two variants – Standard and FI. Both the variants get the special edition models. The Intruder SP is priced at Rs 1.05 Lakh and the FI SP retails at Rs 1.07 Lakhs (price ex-showroom). The Suzuki Intruder SP comes with the same features as compared to the standard FP. It comes with features such as Twin exhaust system, fully digital speedometer, Intruder styled LED headlamp and ABS. It classifies as a modern cruiser, with all the latest technology and features. 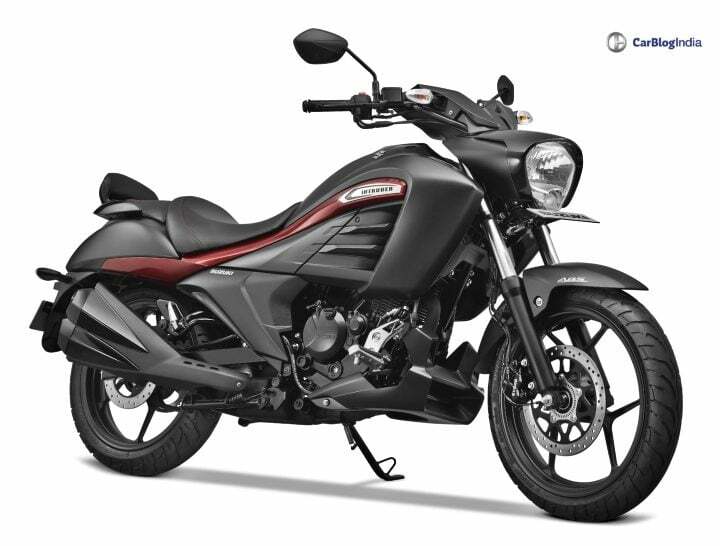 The Intruder comes with a 154.9cc engine, which is found in the Gixxer too. The engine produces around 14.7 BHP and 14 Nm of peak torque. The engine comes with an option of Fuel Injection System in addition to the standard variant. FI systems help a bit in maintaining the mileage of the bike. The mileage estimated on the Intruder is around 45 kmpl. When we talk about the design, it is one of a kind cruiser. The Intruder basically derives its looks from the bigger Intruder 1200. In the front, it gets the traditional Intruder LED headlamp. Other design elements include a low slung body, the sporty twin-exhaust mufflers, the body claddings and in the Intruder SP, a new backrest. The Suzuki Intruder has a height of 1095 mm, length of 2130 mm and width of 805 mm. It weighs 149 kgs and comes with a fuel tank capacity of 11 Litres. For braking, it gets front and rear disc brake with a single-channel ABS feature. For suspension duties, there is Telescopic function in the front and Swing Arm Type suspension in the rear. The Intruder mainly competes with the likes of Bajaj Avenger Street 180. Now, Avenger is the cheapest cruiser in India. Also, Avenger is a much-trusted bike in the market than the Intruder. But, Intruder gets the title of a modern cruiser with all the latest features, which Avenger heavily lacks on. The standard Intruder comes at a price of Rs 99,995 and the Intruder FI retails at Rs 1.06 Lakhs (ex-showroom prices New Delhi).